"You say goodbye and I say hello. Hello, hello. I don't know why you say goodbye, I say hello." We bid adieu to Paris Fashion Week today just as Marc Jacobs says au revoir to Louis Vuitton. After 16 years of rebuilding the Parisian fashion house, the former LV creative director is packing his bags and heading back to New York where he can focus on his own brand. His final show earlier today took place in the Cour Carrée du Louvre tent where he commemorated his history with LV by creating a magnificent set that included elements from previous shows: a carousel, fountain, pair of escalators, and a grand hotel elevator. The theme was all about showgirls. “The first thing I thought was about Esther Williams and synchronized swimming,” Jacobs said. “But then I decided I wanted to do something about black, sparkling black, and texture and night!” Feathered headpieces and beaded detailing gave drama to Jacobs's exit collection. And aside from a few pairs of blue jeans, the only color on the models was black. Being his last LV collection, is it a coincidence that he chose the color associated with mourning? He also included the LV graffiti from past handbags, with those three little words, "I love Paris". Jacobs summed up his collection by saying, "It was an ode to Paris and to all the people I have been involved and work with. This city has been so great." After hearing the news of Jacobs's departure, the real question is, what's next for Louis Vuitton? It is rumored that a new creative director will be named by late October. The show must go on! 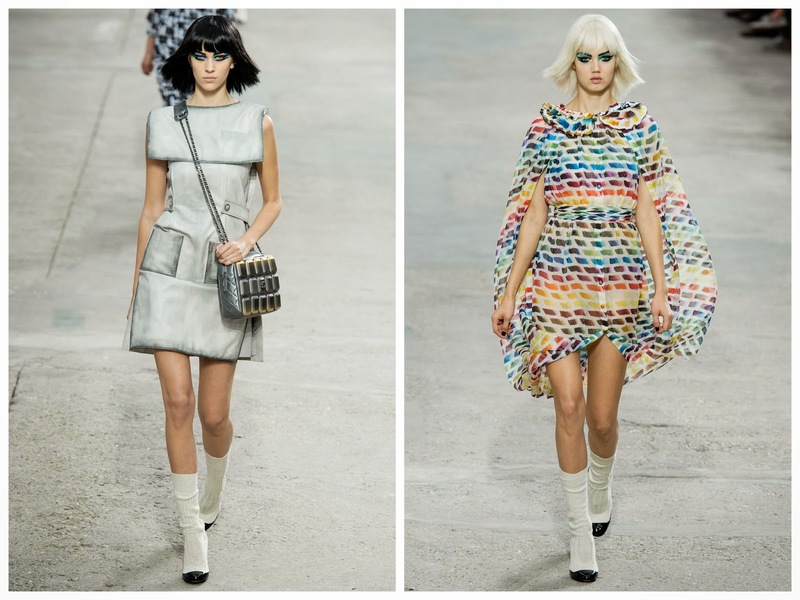 What Louis Vuitton was lacking in color, Valentino and Chanel made up for. Valentino creative directors Maria Grazia Chiuri and Pierpaolo Piccioli gained inspiration from opera. Their designs were full of vibrant hues and gold accessories that complemented the color palette. Karl Lagerfeld's new collection for Chanel was a tribute to art, although when addressing the topic, Lagerfeld said, "I’m collecting books. I have no space for art.” The Grand Palais was transformed into a pseudo gallery with artwork lining the walls. The wearable designs were full of life and Lagerfeld included bright tweeds that will shine next spring. "Life is not a red carpet," Karl explained. "This is for daily life. I wanted color, and a fraîcheur. It’s a very happy mood." This week I have been sewing my heart out. In fact, there are horrific screeching sounds coming from my serger that are probably a result of overuse. I made a long-sleeved striped cotton tee, cotton sateen black pants, a fully lined zip-up jacket out of an Italian fabric, and a graphite colored dress with cap sleeves. Pants are not my forté, so they were a challenge and the jacket was my biggest accomplishment thus far. It took me quite some time to figure out how to properly line the jacket while also installing a zipper up the front. The dress was a fairly simple design, so I wanted to add interesting belt loops. The only fabric I had to work with at that point were two scraps that were cut into cap sleeves. I added white trim so they would stand out, attached them to the dress, and voilà!